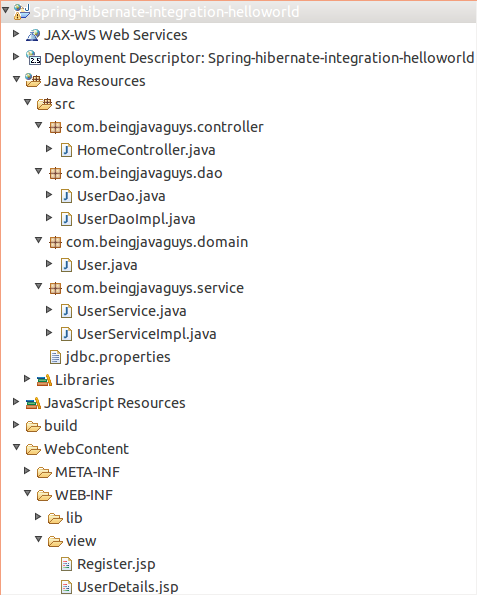 Today i will walk you through the integration of Hibernate with a Spring MVC application using annotations. In this particular blog we will create a simple Hello World application in Spring and Hibernate. Our objective for today's discussion id to create a simple registration form using spring's tags, the data is to be persist in a MySql database and after that we will retrieve the data from database and will show the data in table form. The very first step to start an application is creating a database, lets create a database with name 'beingjavaguys_db' and create a 'USER' table in it. To create database simply copy the script below and run it in your 'query editor'. 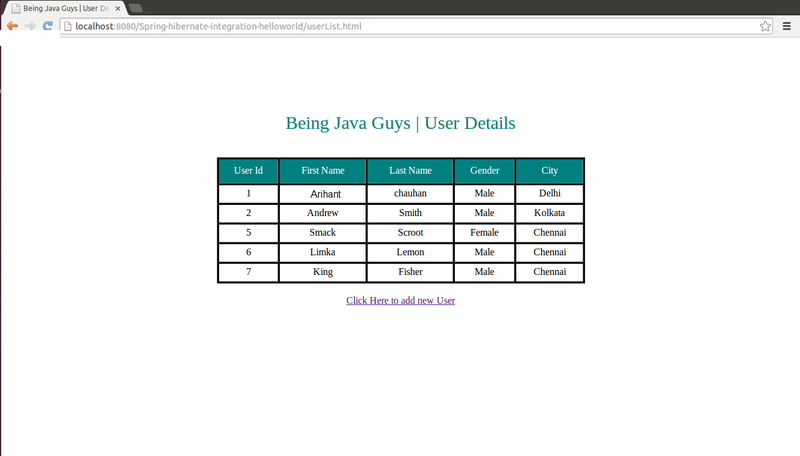 This will create a database and table with required fields. Before we start adding some code to our application lets take a look at overall project structure. Create a simple 'web application' project in 'Eclipse' and add all code files to it as mentioned in rest part of this blog. First of all add some entries to your 'web.xml' so that the 'tomcat container' could understand the behavior of application. Add a servlet entry point for 'DispatcherServlet' to make the container understand that all spring configuration is done in it and going to be used accordingly. Now add 'url-mapping' to 'DispatcherServlet' , this tells the container that all requests with /'.html' extention are going to be handled by spring itself. At the end of the file a entry for welcome file is added that indicates the starting point of the application. In 'index.jsp' a 'SendRedirect' is added that redirects the control to '/register.html' so that spring could take the command from this point. <%response.sendRedirect("register.html"); %> < !DOCTYPE html PUBLIC "-//W3C//DTD HTML 4.01 Transitional//EN"
We have added a controller with name 'Home Controller' and configured it using required mappings. '@Controller' tells that the class is going to be used as a controller for the application. '@RequestMapping' tells that the method will behave like an action for the mentioned 'url pattern'. Whenever a request pattern will match to the pattern specified in '@RequestMapping' the code written in related method will be executed. Here you can see that the every action is returning an object of 'ModelAndView' class. 'ModelAndView' class offers a number of things to the application, the very first parameter that is passed to it, represents the name of view(required jsp file) that is going to be rendered after completion of action's code. The second parameter indicated a String value key for the object that is placed as third parameter. Using these capabilities we can send an object to view associated with a key. DAO stand for data access object, it makes it easy to communicate the application with database. We are using an interface here this implements standard industrial practices. Required methods are declared here and being implemented in related implementation class associated with it. This is implementation class for UserDao interface, all methods declared in UserDao interface are implemented here to achieve the goal. 'saveUser()' method takes an User's object as parameter and persists it in the database using 'sessionFactory' object. Similarly 'getUser()' method is returning a list of User's object using a Hibernate Criteria query. To represent User entity within the application and to persist User's objects we uses a User class with all required fields. This is nothing but a simple java bean with some Hibernate annotations. @Entity tells that the class is a domain class that maps to a table in the database. The name attribute of '@Table' specifies the table name in the database. @Id tells that the related column is going to represent the 'primary key' for the table and @GeneratedValue show auto increment nature for related column. The name attribute of '@Column' specifies the related column name for the field. Service layer is added here to implement two layer architecture for the application, it works some kind of interface in between the application and database transactions. Its always a good practice to have a service layer in your application so that the application data can be isolated to database code and reusability can be enhanced. This is implementation for UserService interface, service methods are called in application controlled to perform database stuff. A property class is added here to specify all required database properties in a separated file, show_sql=true make all database queries to show on console. 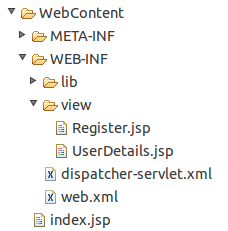 Dispatcher servlet is the root of an spring application, all spring configurations goes here is a single file. The 'jspViewResolver' bean specifies the view files path and its prefix and suffix attributes makes it easy to use simple view names in application rather that specifying full path. Here we are done with creating a simple hello world application using Spring and Hibernate. Just run your application on server, if everything went right you will see output something like these screens showing below. 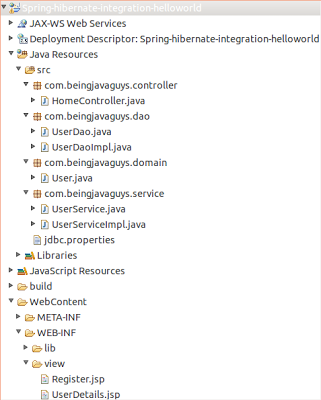 In this blog we went through Spring, Hibernate Integration process and we get to know 'How to create a simple hello world applicaton is springa and hibernate using annotations'. In upcoming blogs we will dive into some others tutorials using spring and hibernate technologies.